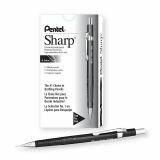 Pentel Sharp Mechanical Drafting Pencil, 0.5 mm, Black Barrel - Automatic pencil features a 4mm fixed sleeve for template work and technical drawings. Metallic-mesh grip delivers precision and control. 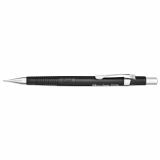 Technical drafting pencil offers a concealed eraser and automatic lead advance. Refillable with Pentel Super Hi-Polymer Lead and Z21 refill eraser.